When you arrive at our church on Sunday’s you are greeted by some fantastic members of our team who offer you a name tag. You can opt out of this experience … but our hope is that the majority of our people at our services will decide to get a name tag. Guest Oriented // People want to be known. I know that there is a school of thought that says that people want to be totally anonymous when they arrive at church. The dangerous application of this belief is that we go out of way to make it hard for people to connect. We want to give people space to control their experience with our church but we want to meet them when them are ready to connect. The first step to getting connected is by allowing a nice member of our team to make up a name tag. It’s an Invitation to Talk // The implicated in the name tag is an invitation to talk with other people. Our hope is that when people come to church that they connect with the community … the goal is to get people talking to each other! People love to hear their own name … it’s the sweetest word they hear all day. By offering name tags we are multiplying out lots of great conversations in church. What a positive emotion to associate with our church! Creates Service Opportunities // In order to make name tags for large crowds you need a lot of people ready to make them up. This creates more service opportunities … more service opportunities means more people connected to the church! Helpful for Your Team // Let’s be honest … you can remember maybe 200 people’s names when you see their faces but you can probably remember stuff about 1,500 people when given their face and name. (Think about Facebook … the fact that you see people’s names and faces boosts your recall about the details of other people’s lives big time!) The name tag helps your team remember a little bit more about your people by just giving them a little bit of information about your guests. It’s Not About You … // Name tags by definition are about the other people around us not ourselves. It’s a declaration that I’m not the center of this universe … that I acknowledge that everyone doesn’t know me … that I’m not that big of a deal. When we put on a name tag we are serving other people who might feel uncomfortable coming up to me. Where do you get the name tags? Is there a place to buy them in a larger quantity at a lower rate if you are offering this each week? I love the idea and may look to start it. When you started it how much explanation did you give to the people? or was it just more organically offered without explanation? Sorry for the ramble but I love the idea. Thanks for checking in. We have two different types of name tags. We get some custom ones printed up for our volunteer teams … the look snappy. 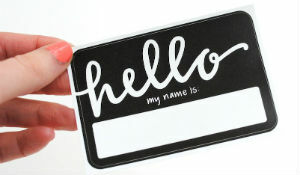 Then we purchase name tags in bulk for the ones for our guests. I’ve provided links below to the places we purchase those. Thanks again! Rich, do guests catch on to the “you have a printed name tag and mine is hand written” motif? The ones are team use are still hand written… They just have our logo on them. It sort of completes the “uniform” because our volunteers wear tshirts too. Make sense?